I was delighted to have made the Final of this very prestigious award. Please kindly click on certificate in order to view my award achievement in more detail. Your day is all about you and your style. 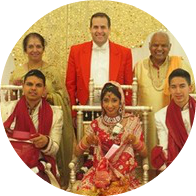 I will make your Asian Wedding, stress and worry free. I will bring lots of direction and energy to The wedding or event. Your Style, Your Way. Many Packages available to suit your requirements. My goal is to ensure your Event will be perfectly delivered. I will recommend lots of personal and unique touches. ​Leading and Dancing in the Baarat is one of my specialities. I am also present at the Anand Karaj in the Gurdwara for the Sikh Wedding, Pandit Rajiv Sharma said, " it is the first time I have even seen an MC dancing and leading the Baarat. " I look forward to working with you closely from day one, going through all nuts and bots in detail, fine tuning the day, prepare the schedule with you, recommend lots of very modern and unique touches, work according to your personal style, coordination, assist with the preparation of speeches ,organization, recommending and booking of suppliers, take the stress of you all, and most importantly ensure that the bride and groom and families and friends, will have memories in their hearts for a lifetime and beyond. 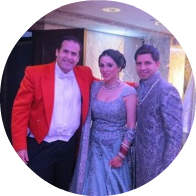 As well as Weddings I also cater for Engagement Parties, 21st Birthday Parties, Asian Corporate Events, Fundraising Events, Award Ceremonies, Gala Dinners, Asian Corporate Functions, Chinese Wedding Services and lots more.. I am located on The London and Essex and Kent borders. Being conveniently located within The UK, I am very accessible, to all other counties, some of which include Berkshire, Kent, Middlesex ,Hertfordshire, West Midlands ,Leicestershire, Bedfordshire, Warwickshire, Derbyshire, Nottinghamshire, Manchester, Tyne and Wear, West Yorkshire, North Yorkshire, Cambridgeshire, Cheshire, Surrey, Berkshire, Buckinghamshire, Sussex, Staffordshire, Hampshire and indeed Nationwide and USA and Canada and India and Nationwide. Jonathan receives ' Freedom of the City of London ' Presented at a Lavish Ceremony at London Guildhall. 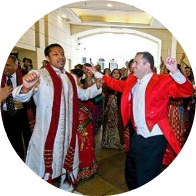 ​Many fellow Asian Wedding Professionals agree that my English Toastmaster services for Asian, Hindu, Punjabi, Gujarati, Sikh, South Indian, Arabic, Buddhist, Muslim, Indian and Chinese weddings, are now regarded as The second most important part of The whole process, with The bride and groom getting married, at number one of course. ​I Have a very thorough knowledge of Asian and Indian Customs, traditions and protocols, and you can rest assure that you will be in very safe hands. Please feel free to view my reviews and testimonials, which will re-assure you about the level of service In which I provide. In The picture above is Shah Rukh Khan, The leading Bollywood actor. On The 25th October 2011, I was involved in a Corporate Event/ Press Conference, officiating as Master of Ceremonies at The 5 Star Montcalm Hotel in Marble Arch in London. ​I was delighted to receive a testimonial from The organisers which is as follows:- " Mr Khan, as you are aware, arrived late due to other commitments. You were very patient throughout, along with being very helpful and professional "
​Some of The towns I cover as Toastmaster and Planner and Wedding Services for Asian Weddings include, London, Essex, West London, East London, South London, North London, Essex, Redbridge, Harrow, Leicester, Birmingham, Slough, Luton, Reading, Southall, Ilford, Pinner, Dudley, Walsall , Bexley, Sidcup, Greenford, Watford, Kenton, Woking, Croydon, Hayes, Coventry, Wandsworth, Hammersmith, Tooting Sheffield, Bolton, Bradford, Manchester, Chester, Liverpool, Guildford, Leeds, Rochester, Chelmsford, Wolverhampton, Solihull, Colchester, Farnham, Southampton, Bournemouth, Romford, Hayes, Walsall, Leamington Spa, Nuneaton, West Bromwich, Warwick, Northolt, Staines, Cobham, Solihull, Uxbridge, Edgware, Stanmore, East Ham, Stratford, Hillingdon, Wood Green, Southgate, Enfield, Hounslow, Richmond, Twickenham, Egham, Richmond, Manor Park, Chigwell, Loughton, Harlow, Cambridge, Peterborough, Newbury, Bristol, Bedford, Oxford, Hendon, Derby, Isleworth, Barnet, Greenford, Northolt, Hounslow, Ealing, Iver, Gerrards Cross, Windsor, High Wycombe, Oxford, Purley,Weybridge, Southend-on-Sea, Redbridge, Gants Hill, Chelsea, Kensington, Earls Court, Greenwich, Nottingham, Chelmsford, Cardiff, Swansea, Newcastle, Sunderland, Glasgow, Edinburgh, Swindon, Bristol, Southampton, Derby, Swansea, Newcastle Upon Tyne, Glasgow, Edinburgh, Belfast, Dublin, Middlesborough, Teeside, Gillingham, Orpington, Maidstone, Gravesend, Dover, Folkestone, Chatham, Kingston , Portsmouth, New Malden, Brighton, Bromley, Milton Keynes, Northampton, Woolwich, Sheffield, Milton Keynes, Northampton, Rochester, Canterbury, Doncaster, Middlesbrough, Maidstone, Stoke on Trent, Newbury, Dover, Tunbridge Wells, Tonbridge , Ipswich, Norwich, Manchester, Preston, Swansea, Wales, Northern Ireland, Republic Of Ireland, Scotland and lots more.